The current atmosphere of Mars is tenuous, with a surface pressure only about 3% of Earth’s, and consisting mostly of carbon dioxide. Almost no liquid water is present on Mars, although the polar caps contain frozen water and carbon dioxide (dry ice). The current thinking is that the atmosphere and surface volatiles can either be lost up or down or both. Volatiles can be consumed by the Martian crust and stored as minerals, and the Curiosity rover and its science team is studying this type of loss. And atmospheric species can also escape to space from the top of the atmosphere, and NASA’s MAVEN mission is studying this. The mission principal investigator, Bruce Jakosky, is leading a team of about 100 scientists from around the world. MAVEN is the NASA acronym for “Mars Atmosphere and Volatile Evolution”. The MAVEN spacecraft was launched from Cape Canaveral, Florida, in November 2013 on a Delta booster and went into orbit around Mars a year later. The spacecraft has 8 instruments designed to characterize the upper atmosphere of the planet and the processes controlling the atmosphere, including how atoms and molecules can escape the gravitational attraction of the planet and escape to space. The instruments measure atmospheric densities and temperatures for both the electrically neutral (e.g., carbon dioxide, CO2, atomic oxygen, O, atomic hydrogen, H, and other species) and the electrically charged constituents (that is, ions such as CO2+ and O2+, and electrons). Other instruments detect energetic charged particles, magnetic fields, and ultraviolet radiation. The MAVEN team also includes scientists who construct computer models of the Martian atmosphere and space environment in order to interpret the spacecraft data. In order for an atom or molecule to escape a planet, two things are required: (1) its speed must exceed the escape speed, which is 5 km/s for Mars and 10 km/s for Earth, and (2) it must be high enough in the atmosphere such that it does not collide with another atom on its way out (this part of the atmosphere is called an exosphere). The ionized portion of the uppermost atmosphere, called the ionosphere, can provide a means of giving atoms high enough speeds to escape. 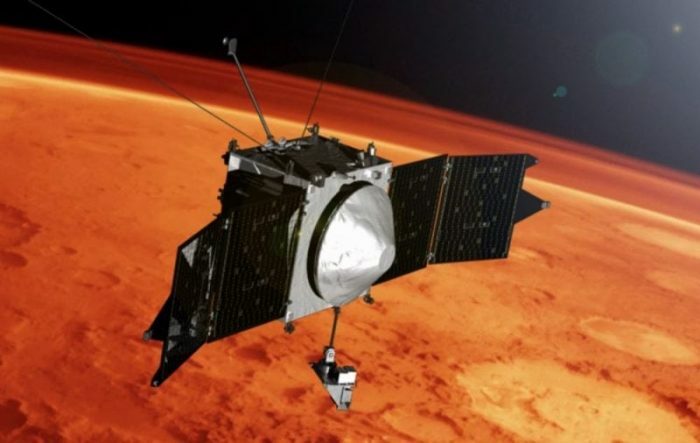 The MAVEN Mission is studying the ionosphere of Mars. Ionospheres are formed when external radiation, or energetic particles, ionize a neutral molecule, knocking off an orbital electron (which is then called a photoelectron or a secondary electron) and creating a positive ion. The most important ionizing source is photoionization by solar ultraviolet radiation, which is produced in the outer layers of the solar atmosphere (i.e, the solar corona). This radiation, like all electromagnetic radiation, is packaged into photons, which each contain an energy proportional to the frequency of the radiation. If a photon has an energy exceeding the binding energy of an atomic orbital electron then ionization occurs. The ionization of neutral CO2 and O produces CO2+ and O+ ions. Chemical reactions (e.g., CO2+ reacts with O to give O2+ ions, that is, ionized molecular oxygen) modify the composition of the ionosphere. And in order to balance electrical charge, the ions and electrons eventually recombine. For Mars, the key recombination reaction is of O2+ ions with electrons (called dissociative recombination), which produces two fast neutral O atoms. About half these atoms have speeds greater than the escape speed and thus have the possibility of leaving Mars. This “photochemical” escape process has been identified as being of great importance for Mars (but not, interestingly, for Venus, which has a higher escape speed). MAVEN scientists are quantifying the loss of oxygen (leading ultimately to the loss of CO2 or H2O from the lower atmosphere) by studying the relevant ionospheric processes discussed above in two ways. The first way is by measuring the densities of electrons and O2+ ions, as well as neutral densities, and then calculating the oxygen photochemical loss rate. The second approach, discussed in a recent paper in the Journal of Geophysical Research (doi: 10.1002/2016JA023461), is to bookkeep on solar UV photons entering the top of the atmosphere and that are energetic enough to create ions. This study determined 2 kilograms of atomic oxygen is lost to the planet every second. This does not seem a very large loss rate, but it has taken place relentlessly for more than 2 billion years, and the equivalent water or CO2 lost over this time period is in excess of several meters of liquid water spread over the whole surface of Mars. This estimate takes into account the fact that the ultraviolet irradiance of the Sun was considerably larger in the distant past, as confirmed by astronomical measurements of younger Sun-like stars in the nearby galaxy. 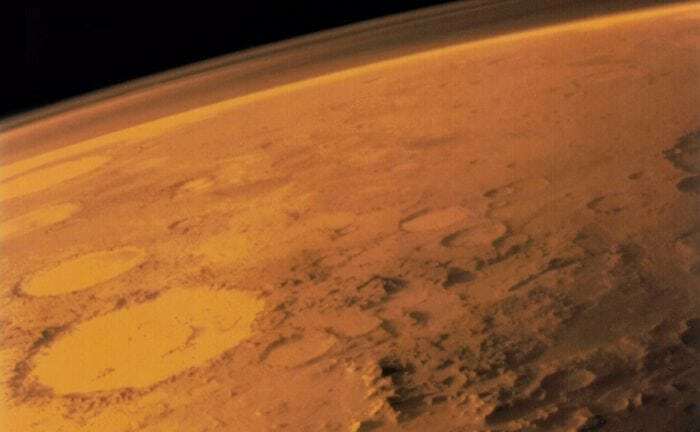 This study, Hot oxygen escape from Mars: Simple scaling with solar EUV irradiance was recently published in the Journal of Geophysical Research: Space Physics. Thomas Cravens is a professor in the Department of Physics and astronomy at the University of Kansas. His research focuses on: Atomic scattering theory, Physics of the interstellar medium, Data analysis for the ultraviolet nitric oxide experiments on the Atmosphere Explorers C and D, Theoretical modeling of atmospheres and the ionospheres of Venus, Earth, Mars, Jupiter and comets including airglow, photoelectrons, energy balance, ion chemistry, and ionosphere-magnetosphere interactions, and Comparing results of ionospheric models with Pioneer Venus data. Previous Post« Previous How Many Countries In Africa?